When high school principal Alexander Ponosov took delivery of 16 computers, he must have felt it was a real accomplishment for a school in a tiny Russian village. It never occurred to him that on that day in August 2005 he became a criminal. "I was not very well versed in computers back then," said Ponosov in a phone interview with CBS News. "I went to my friends who knew more about PCs than I did and they told me that PCs today come with pre-installed software. So, we took the computers." The computers for the school had been supplied by the regional administration. 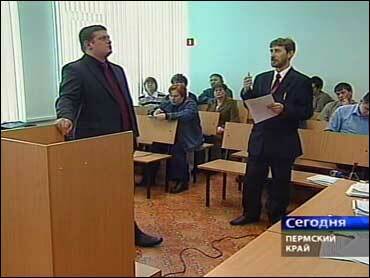 But in his village of Sepych, about 1,000 miles from Moscow, Ponosov did not know that the Microsoft software installed on the computers was pirated. Now, the bewildered director is facing up to 5 years in prison and more than $10,000 in fines for copyright violation. Russia has been extensively criticized for its failure to protect intellectual property rights. The trade group Business Software Alliance estimates the level of pirated software in Russia at 83 percent. A wide range of pirated CDs and DVDs are openly sold by street traders and small shops in any Russian city. You can even buy them on the sidewalk in front of the famous Lubyanka headquarters of the Federal Security Service, the former KGB. In trying to improve Russia's image, authorities have begun raiding illegal production facilities, arresting shop owners, and now, going after end-users of pirated materials. Alexander Ponosov believes there is a simple reason why they singled out the director of a village school in an attempt to uproot piracy. "It is a classic Russian mentality," he says. "They do not touch the oligarchs because oligarchs have got money and can bite back. They go after someone poor and toothless, like us." The school head has been officially charged with violating copyright law and using pirated software. His case has already drawn a wide public outcry and even made some political forces step in and support the beleaguered teacher. "A rural high school teacher can hardly be considered the main intellectual pirate in this country," says Mikhail Seslavinsky, head of the Federal Agency for Press and Mass Communications. "Once you start punishing users (of pirated software) half of the country's population, including the law enforcers themselves, may end up behind bars." A Microsoft representative speaking with CBS News did not sound bloodthirsty: "I had to attend the hearings as it is required by the law – I was summoned to the court by the investigators in order to assess the damage incurred by Microsoft," said Alexei Potapov. "I had to give a retail price of the legal versions of the Microsoft products, installed on the school computers in Sepych, which was slightly over $10,000." Microsoft has decided not to file a civil lawsuit against Ponosov "because we understand well he is just an ordinary school master and he runs an ordinary Russian school," said Potapov. "However, no one has the right to break the law." Alexander Ponosov insists he is innocent. "This whole campaign may have started off as a crusade against software piracy. But as time went by, law enforcers realized they were unable to find the real perpetrators of the crime — those who illegally copied and distributed the pirate Microsoft products. And then the solution presented itself: go after an easy target. So, they picked us," Ponosov said. In attempting to show their commitment to rule of law, Russian authorities have instead created, in Ponosov's words, a farce. The hearings resume on February 12. The outcome of this case will eventually determine whether millions of pirate software users in Russia could be considered criminals.